My second volume of poetry is titled “Reflections“, and it features 100 poems from different stages in my life. could see you once again. Life is so short and yet a day without the person you love seems like an eternity. Steven R. Drennon captures this situation so fully in many of his poems. He effectively explores the intense longing we all feel when in love. 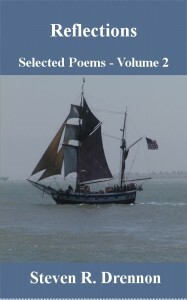 In this book his poems are mostly romantic and passionate. He has a sensitive heart and feels more deeply than most. He presents the full range of emotions from the beautiful memories of new love to the end of love when someone tells you goodbye. I was truly captivated by these poems as they radiate a unique warmth. You will find comfort in these experiences of loneliness and joy. While many of the poems are positive there are also some that speak of mistakes, regrets and disappointment. This is Steven R. Drennon’s second book of poems – I look forward to reading all his books in the near future.